Apple has just updated the Mac Mini to a new, faster configuration with Intel Core i5 or i7 with Ivy Bridge as well as up to a terabyte of hard drive space. The Mini also comes in a server configuration for $999 with a faster processor. This model can hold up to 16GB of RAM and it supports Bluetooth. 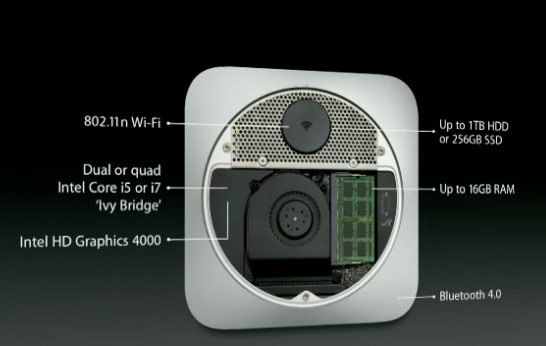 It also has an Intel HD Graphics 4000 GPU in a package Mini fans will recognize. These slight improvements help the Mini inch its way up closer to the iMac and Macbook line as an entry-level desktop solution. The new Mac Mini starts at $599 and ships today.